How Are Oral Health and Alzheimer's Disease Connected? Brushing and flossing have long been understood as the best methods for maintaining a healthy and attractive smile. However, recent research is also suggesting strong ties between the state of a person’s oral health and the likelihood of developing Alzheimer’s disease. 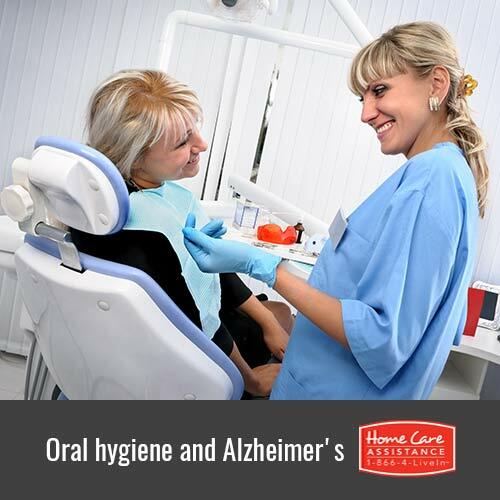 The Harrisburg Alzheimer’s care experts at Home Care Assistance want to share some of this information with you and provide ways to take better care of your senior loved one’s teeth and gums. Pathogenic bacteria that can proliferate in the mouth and widespread tooth loss appear to be tied to the onset of Alzheimer’s and a decrease in overall brain functioning. These harmful microorganisms are responsible for periodontal disease and tooth decay and are not necessarily confined to the mouth. When gum health complications are allowed to progress, these bacteria can infect the underlying bone structures and enter the bloodstream. Once this occurs, infections that were once localized can become systemic and cause widespread damages. When harmful microorganisms are allowed to proliferate as the result of inadequate oral care, pathogenic bacteria can also enter the bloodstream through a number of common activities such as brushing the teeth or chewing. The need for invasive dental treatments can also increase the spread of these organisms. Researchers believe systemic infections caused by these bacteria are frequently responsible for confusion and deterioration of memory, which are two of the most common symptoms of Alzheimer’s disease. Several studies have also pointed out a higher rate of Alzheimer’s among aging adults with significant tooth loss. Although tooth loss is largely attributed to the breakdown or decay of natural tooth structures, these developments are frequently the result of gum inflammation and periodontal disease. Thus, the increased prevalence of Alzheimer’s in adults with missing teeth is not connected with the absence of these structures themselves, but the oral conditions that invariably led to their loss. Oil pulling is an ancient Ayurvedic practice in which a teaspoon of high-quality oil is swished around the mouth for approximately 15 to 20 minutes. The oil is then spit out and the mouth is rinsed with warm saltwater or a disinfecting mouthwash. The best oils to use are coconut oil and sesame oil because of their inherent antibacterial and antifungal properties. These efforts can alleviate gum inflammation, minimize the development of plaque and cavities, and loosen food particles that are not dislodged by flossing. Oil pulling is ideal for seniors with sore or inflamed gums and for people who are unable to get optimal results from brushing and flossing alone.